Please note: A recipe extract is included at the end of this post. I must admit that the last time I watched a whole series of MasterChef UK, from start to finish, or any other MasterChef to be honest, was in 2011. I cannot pinpoint exactly the reason or reasons why, but I guess it must have been something to do with the people taking part. It’s probably the only series in which I can remember the finalists clearly, but the one clip I will never forget was the one in which they had Yotam Ottolenghi as a surprise judge. Jackie Kearney’s smile radiated through the television screen. From that point on I rooted for her and wished she could win. She didn’t but of course, that was just the beginning. I just love how the books piling up on my desk at the moment are so vibrant, both on the cover and on the inside. Beautiful in every sense of the word. They really and truly reflect the brilliant and kaleidoscopic food they carry inside. All the photography is gorgeous and make me want to spend more time in the kitchen. 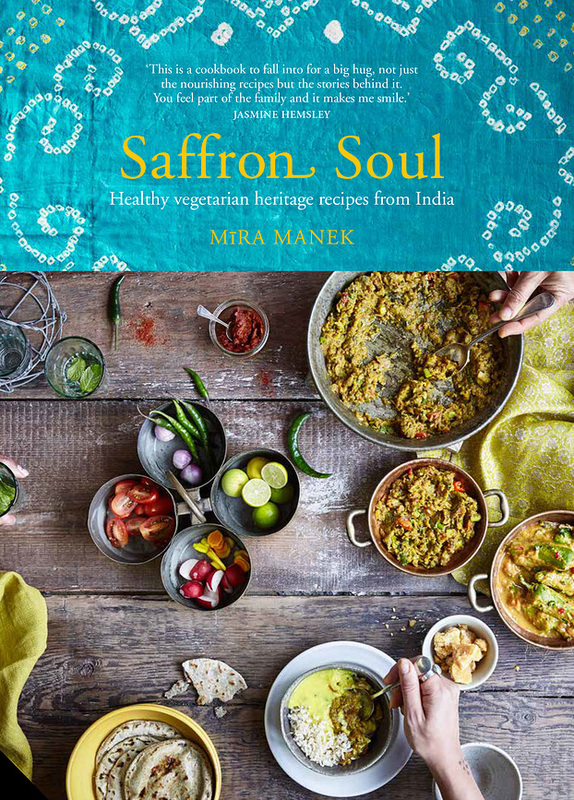 Saffron Soul: Healthy, vegetarian heritage recipes from India (out on Monday 24th April) is also an example of this. British-born Mīra Manek is of Indian heritage. She is an advocate for healthy cooking, and spends most of her time tweaking and adapting her family dishes to make them lighter, debunking the idea that Indian food is necessarily unhealthy. Mīra collaborates with restaurants and cafes, encouraging them to promote and serve healthier options, as well as running supper clubs, cooking classes and wellness events.